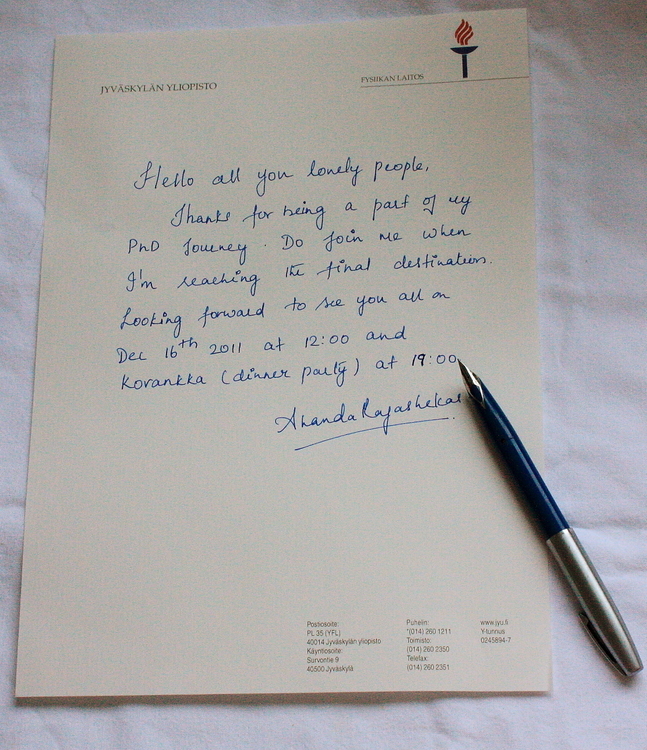 Another year is coming to an end, and it has a been a glorious end, with me designated as Dr.Ananda Rajashekar. I'm yet to come back from state of elation. It was a beautiful experience, hard to describe in few words with a nervous start in the morning, then gradually getting engrossed in conveying my 6 yrs of research followed by hours of thoughtful discussion.... The day ended with great party with most dear people, cherished speech, gifts and their love.....A day I enjoyed the most and a day I would remember for life! Will write more in detail with pictures soon! The date I will be defending my thesis is on Dec 16th. Join me and send me all your wishes. You all have been a part of my PhD journey. Without all your good wishes the day wouldn't be complete. Thesis is ready, this is the copy of pre-print version (today i'm correcting printing errors). Presentation is ready, wardrobe is ready, venue, menu all set and organised. I'm excited equally nervous.... Sigh! !....all I dream of is my opponent whipping and baking me as a cake! Here goes my invitation and copy of my thesis to you all :) will get back pretty soon!